Demonstrative is a pretty dramatic term to encompass a few simple (and familiar) words: THIS, THAT, THESE, and THOSE. In conversation, demonstratives get their context from the environment (and possible hand gestures). In written language, they get context from the surrounding sentence information. Fig. 1 Flowchart of English demonstratives. In Arabic, demonstratives are a bit more complicated (surprise!). They function the same way as in English (pointing at nouns/pronouns), but with a few added bonuses. Like in English, Arabic demonstratives are distinguished by number and proximity. One thing, plural thing. Near, far. However (bom bom bom), they also have a subcategory within plural (dual). Plus a new category: gender. Dual and gender are woven through the Arabic language, so no one should be shocked by this information. If you are shocked, please have a little lie down before looking at the next flowchart. Fig. 2 Flowchart of Arabic demonstratives. Fig. 3 Highlighted: most used Arabic demonstratives. Note: we'll address the human vs. non-human shenanigans down the right side of the flowchart in a minute. Arabic definitely goes to town with the demonstrative options. As indicated in figure 3, you will mostly use the singular and plural forms. Try not to leave things in pairs around the house. Let's have a look at singular and plural, then dual. There's nothing quirky or unusual about singular demonstratives. It's just a nuisance having to remember a masculine and feminine form for each. Hopefully dressing them up as monsters might make the remembering part of the process easier. Here are some monsters I prepared earlier. You'll notice the near-pointing monsters have cropped arms appropriate for their short-distance gesturing. Haa-thaa (هذا) and Haa-theehee (هذه) come from a long line of short-armed ancestors. Their forefathers and mothers were great storytellers and micro-gesture-ers. They've long been interested in things here. This fang here on my face. This kunckle here on my hand. This foot here next to my other foot. Here here here here. Hh hh hh hh hh. The very same sound at the beginning of the monsters' names. Haa-tha. Haa-theehee. So if the THIS you're referring to is HERE (relative to you), remember that H sound from HERE is the H sound you need to say your Arabic demonstrative. If it's HERE it's HAA-THA or HAA-THEEHEE. 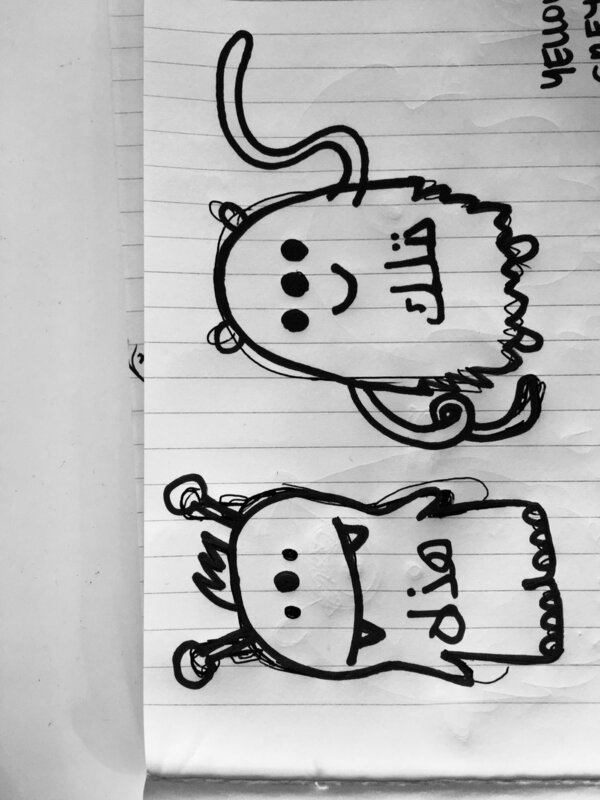 In the long-distance camp we have wiggly-armed monsters Thaa-lika (ذلك) and Til-ka (تلك). Monsters of the long-armed variety are exceptional at pointing far. Rather than gesturing here, these monsters repeatedly point there. That fang there on your face. That knuckle there on your hand. That foot there next to your other foot. There there there there. Th th th th th. The same sound that graces the beginning of the monsters' names – almost. It's a bit more of a stretch because Til-ka is a T sounds rather than a Th sound, but close enough. If the THIS you're referring to is THERE (relative to you), remember that TH sounds from THERE is the TH sound you need to say your Arabic demonstratives. If it's THERE it's THAA-LIKA or TIL-KA. Now, why did plural demonstratives get divided into human and non-human in the flowchart? Did not see that coming. For some reason we have plural non-human nouns (pineapples, shoes, teddy bears, lamps ...) behaving grammatically like singular feminine words (pineapple, shoe, teddy bear, lamp ...). All the single ladies. Picture a tray of cookies. Instead of saying THESE cookies, you'd say THIS cookies. WHAT IS THIS MADNESS. Yes, yes, I know. I didn't make the rule. 'Cookies' stays plural, but the demonstrative pretends to be singular. And regardless of whether 'cookies' (or equivalent word) is masculine or feminine, the demonstrative THIS is always feminine. This bananas. This plants. This books. This windows. This umbrellas. This paint brushes. Before we move on, a huge shout-out to the (human) plural demonstratives for not having a masculine and feminine version. Half as many things to remember. In case you were wondering, yes, dual demonstratives have two versions of themselves – all in the name of case. For every nominative dual demonstrative there is an accusative/genitive dual demonstrative. Wait, I thought short vowels took care of all that case business? Yes, most words take short vowels to indicate case. Short vowels are like page confetti – they are little squiggles sitting between characters, but the structure of the word remains the same. Dual words, on the other hand, have this raging habit of switching around their long vowels instead to reflect case. Changing a long vowel makes the whole word look different (hence two versions of themselves). Generally, moving from nominative to accusative/genitive results in an alif (ا) becoming a ya (ي). The dual words featured in the flowchart are in the nominative case. In case you need them for a rainy day, here are the accusative/genitive variations lined up beside their nominative counterparts. Nothing says have a great day like ending with a list of dual demonstratives.